"[Tintin is] just unapologetic, shameless adventure." Tintin is all about a sense of adventure and world travel. Director Steven Spielberg and producer Peter Jackson's motion capture animated film adaptation of The Adventures of Tintin lives up to that sense of fun. It plays as a logical extension of Spielberg's serial pulp work from the Indiana Jones franchise. The Adventures of Tintin is pure storytelling fun. Spielberg and Jackson capture all the barreling sense of energy and globe trotting nature from Hergé's classic tales. Spielberg has long been a fan of the Tintin series since film critics remarked its similarities between Raiders of the Lost Ark and the Belgian comic series. 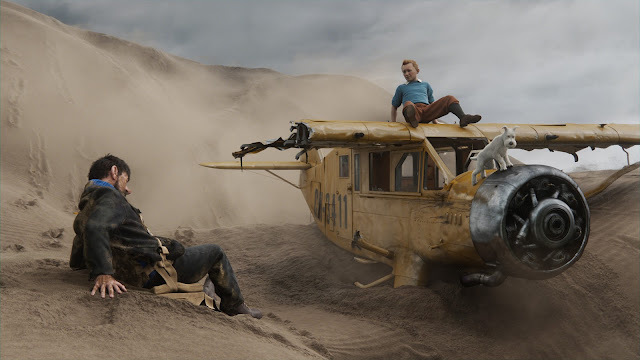 Throughout the film, I kept thinking how true in spirit Tintin was and much more in line with historical adventure than the retched Kingdom of the Crystal Skull. Working in animation, Spielberg's virtual camera sheds real-life limitations, allowing the filmmakers to choreography some breathtaking extended action sequences in a single fluid shot. The long take in the streets of Morocco is 100% Spielberg as is a thrilling sword fight on Red Rakham's pirate ship. The pulsing John Williams' score heightens Tintin's globetrotting travels with cutthroat chases by land, sea, and air. The motion capture acting from the likes of Jamie Bell, Daniel Craig, and Andy Serkis mixes live action elements with animated flair well. However, Snowy the dog is the standout performance. The precocious white dog is a scene stealer at every turn. Tintin plays of the cartoon, animated elements using vocal vues and limitations on facial expressions to play up the pulp nature. I felt the 3D was unnecessary, adding little in the way of depth or visual storytelling. However, it neither detracted from the screen or was bad 3D in general. It was just there. The rest of the animation suited the material well. I loved reading Tintin comic books when I was young as well! They were large, glossy and very entertaining! Great review! I can't wait to watch it in the theatres!